One of my PixelGraphs, Teardrops, will be on display in San Diego, California, from June 7 to July 26, as part of the Digital Art Guild 2014 Juried Show, 'Filters and Masks'. The exhibit catalog is beautiful and a preview can be seen here. 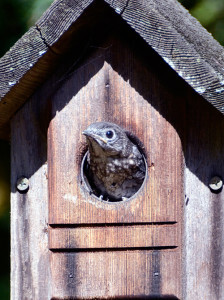 Several weeks ago we realized that a couple of bluebirds were nesting in one of our backyard birdhouses. The excitement and the waiting started, as did my hopes of taking some good pictures of the parents and the chicks. Well, about a week ago they hatched and their parents started the daily back and forth ritual of feeding them. In order to help them, and entice them to bring the babies back, we bought some mealworms. First dried ones, they didn't like them at all. Then, live ones. These worked fine. Two days ago the female disappeared and now it is only the male doing the feeding. 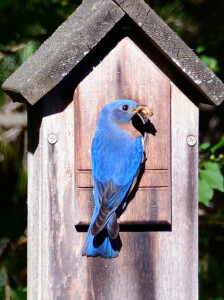 What happened to her is anybody's guess, but the fact is that this male bluebird is doing the job of two. I get tired just watching him, back and forth, looking for food, feeding the chicks, back to looking for food, all day long. Again and again. After this development, the mealworms were even more important, that way he won't have to travel far to get food. 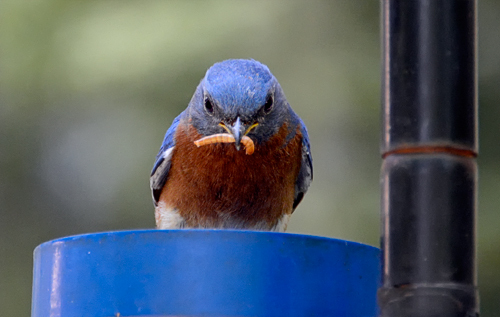 Curious about this, I started reading about bluebird behavior and in doing so I found out that a diet of only mealworm was calcium depleting and that we needed to add some kind of powdered calcium to them. And that started the quest for powdered plain calcium in our neighborhood stores. I can't tell you the way that people looked at us when we were trying to explain our request. Calcium for birds? Finally, we found some plain calcium in pills, which we can mash to mix with the worms. It really touches me the way that Blue, that's what we are calling him, is caring for his chicks. Hopefully, nothing more will go wrong, and with a little help from us, they will be soon roaming the skies.